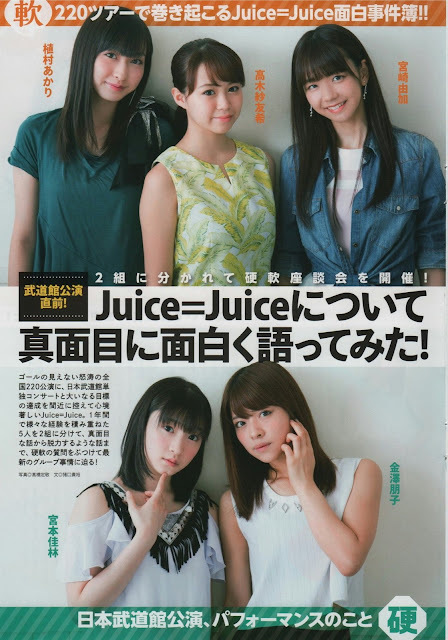 Though interviewed separately, Juice=Juice and Tsubaki Factory were asked about their thoughts on the impending graduation of H!P senpais ℃-ute. Here's what they said in the November 2016 issue of Top Yell magazine. ℃-ute announced the surprising news that they would be disbanding in June next year. Miyamoto: Just as it was with Berryz Kobo-san, it's sad. It feels like an important piece of Hello! Project will go missing. It'll be up to us, the kouhai, to fill that up and go even beyond them, so we've got to absorb all sorts of things from them. Once ℃-ute-san are no longer around, we'll become the group with the highest average age. So honestly, we're feeling the pressure. 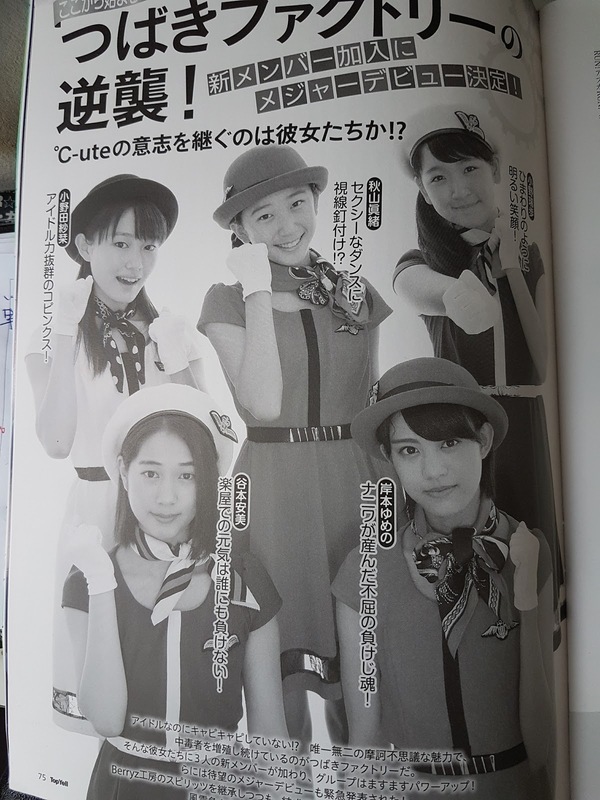 Kanazawa: We're both 5-people units, and the fans have often told us 'Set your sights on ℃-ute and do your best'. I really bear a sense of admiration towards them. In the first place, I entered this world becaused I looked up to Suzuki Airi-san, so you could say that I'm here thanks to ℃-ute-san. Even now, I still can't believe that they won't be in Hello! Project. Their presence was familiar, seemingly absolute. Finally, you're preparing for your Budokan performance on the 7th of November, so please give us a show of your enthusiasm. Kanazawa: Every time our Hello! Project senpais did a Budokan performance, we'd be there to watch and learn. The atmosphere when they're there is a complete change from when we see them normally. They really sparkle, and I really wonder where that energy comes from. I've seen the improvement of girls preparing for the Budokan right in front of my eyes, some of them who are even my kouhai. It's still unbelievable that we'll be getting to stand on that stage. Our Budokan performance was set after going through 220 performances, we went to various regions, various places, we met various people. I think that it's the outcome of the gradually expanding ring of the Juice=Juice family, so I'd like to get my gratitude across. Miyamoto: The 220 performances started with the goal of a Nippon Budokan performance, and the Budokan performance was also set at the same time we announced that we were arriving at that achievement. And while it became a reality thanks to the staff members and family members who supported Juice=Juice, above all, it's because of all the fans wanting to listen to us, and telling us all sorts of things. Through our performances, I'd like to explosively show our gratitude, like boom! With Tsubaki Factory's major debut announcement on the one hand, ℃-ute have also declared that they will be breaking up. How did you receive it? Akiyama: I really love ℃-ute-san, I've always wanted to become an idol like ℃-ute-san. So inside, I truly feel that I'd like them to continue on as a group until forever. Ono: I still can't believe it...... ℃-ute san are perfect in singing and looks, in everything, so I believed that they'd flourish even more beyond this. Among the fans, there are some who see the current Tsubaki Factory as a projection of ℃-ute when they were formed. How do you receive that? Akiyama: Being ℃-ute-san's successors...... I'd like to go on with that thought! I think that Tsubaki Factory can also become a group like ℃-ute-san. ℃-ute are currently called the number ones in the idol world, but back then, they were a group of remnants who didn't end up in Berryz Kobo. In that sense, there's a lot of overlap with Tsubaki. Tanimoto: Is that how it is?...... As fat as that's concerned, I'd like to gradually become like ℃-ute-san. I really want that to happen.... but can we really become like that? Kishimoto: Originally, Tsubaki Factory was started to inherit Berryz Kobo-san's spirit. The stylishness of Berryz Kobo-san, the stylishness of ℃-ute-san..... If we were to inherit the good points from both, wouldn't Tsubaki Factory become an even more wonderful group! ?